Camera: Canon EOS 50D; Lens Canon EF 400mm f/5.6L USM; Shutter speed: 1/2500; Aperture: f/5.6; ISO: 400. 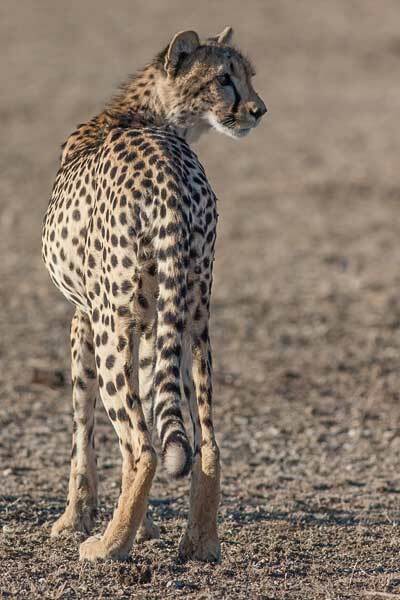 As can be seen in the above photo, cheetah are tall and slender, with long legs built for speed. The head is small and round with a shortish muzzle. Large nostrils allow these sleek cats to gulp down huge quantities of air into the lungs when sprinting. The cheetah's spots are black and cover most the body, including the long tail that it uses for balance when running at speed. At the end of the tail the spots turn to black rings, while the tail tip is white with a bushy tuft.